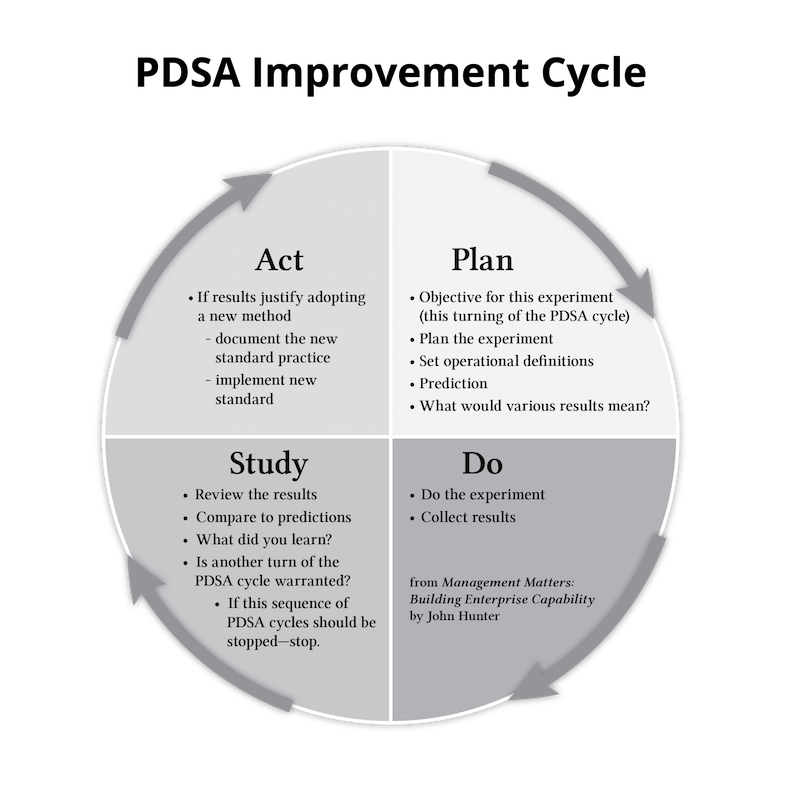 Too often today I hear people disparaging management tools/concepts (PDSA cycle, mistake proofing, flowcharts, design of experiments, gemba…). The frequently voiced notion is that tools are being applied and not helping improve management in the organization. But it seems to me using these tools re-enforce the best practices of management improvement. Yes, ignoring the underlying principles (while applying tools and concepts) drastically limits how successful an organization will be in improving management practices (and limits the results the organization will achieve). But using the tools is not the problem. Using the tools is a necessary but not sufficient part of the process to improve. What is needed is to use the tools with engaged people that are continually learning and adjusting the management system based on their increase understanding of the organization as a system. Using management tools effectively (if you are unsure of what those tools are, read the posts on this blog discussing many management improvement tools) supports gaining insight into the underlying management improvement principles. It is important to understand there are fundamental concepts that connect and reinforce each other. And those organizations that are successful are using management tools and continually building their understanding of the underlying principles. Using the management tools (from lean, Deming etc.) isn’t sufficient but it is necessary to create an excellent management system. For several years I have heard quite a few people emphasizing the refrain that principle (lean principles…) are more important than tools. I don’t think that is a very useful thought process. Both the tools and the underlying principles are catalysts to better management. Alone each can result in a bit of improvement. But when they are used together is when you see remarkable improvement. The effective integration of the principles and the tools is what separates the remarkable companies we respect (and maybe envy) from all the others that are having some success but that are also struggling in many ways. Visible use of management improvement tools that fail to provide much value (often because the connections to underlying principles are not understood and so the management system doesn’t support their use) can be seen as an indication the tool use is unimportant or even detrimental. But, I think this is mistaken. Tools use can be ineffective. But widespread and frequent use of management improvement tools is critical to creating a strong management system. Read the links below for more details on how to build a highly effective organization. This entry was posted in Quality tools, Systems thinking and tagged culture, interactions, management concepts, management system, management tool, Quality tools on May 10, 2017 by John Hunter.